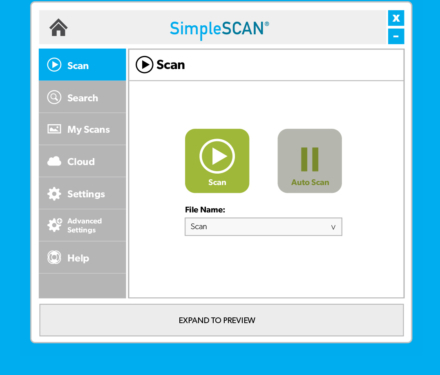 SimpleSCAN – Scanning made Simple. Scanning made Simple. The S1. Durable and reliable for scanning documents, cards and receipts. Paper documents. Receipts. Business cards. The SimpleSCAN S1 captures it all, creating high quality images in color, grayscale or black & white. No matter what you’re scanning, the SimpleSCAN S1 does it anywhere there’s a USB connection. In the office or on the road, the SimpleSCAN S1 adapts to any task or placement. A compact footprint ensures it fits on cramped desks, busy registration areas or your favorite coffee shop. Rugged construction means it stands up to continuous use in commercial applications. The included SimpleSCAN capture software makes your document scanning easy. Save your documents as PDF, TIF or JPG to your local PC, or to one of these popular cloud services: Box, DropBox, Microsoft OneDrive, Evernote and Google Drive. Get the most out of your S1 scanner with SimpleSCAN software. Never worry about losing or accessing a document. Capture, edit, export & more. With selectable auto-scan abilities, SimpleSCAN S1 is easy to use and scans quickly. When auto-scan is implemented, simply put the document or card into the scanner to scan it to your computer. Increase efficiency and effectiveness. OCR technology recognizes text characters, making it simple to edit in Microsoft Word, Excel, PPT, and Searchable PDF directly after scanning. Scan documents to create searchable files in PDF, Word and Excel to search document content and information. Plus making edits and updating document content is now easier than ever. Powered via USB – No external power adapter required and no “warm up” wait time to scan. Professional grade quality – Durable and reliable for scanning documents, cards and receipts. Scan directly to PDF – Included software provides ability to scan directly to industry standard searchable PDF.